Maximus (Russell Crowe) is possibly the greatest General Rome has ever seen. The Emperor has great respect and love for him as if he were his son. The problem is the Emperor already has a son who is less than pleased with his Father’s affection for Maximus. The corrupt heir to be, Commodus (Joaquin Phoenix), cares only for his rightful title and cares very little in regards to the fate of Rome and who he harms on his way to power. With a dead man’s wishes looming over him, Maximus forever and faithfully fights for the redemption of Rome. In any good relationship you need the key ingredient….compromise! Well, it was my turn to compromise since I usually pick chick flicks. 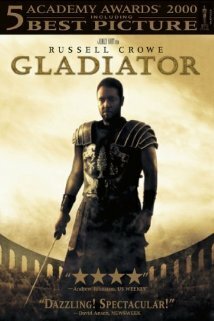 Gladiator was better than I expected and was an all-around very great movie. I’m not usually a fan of Russell Crowe but he was phenomenal in this, I think because I didn’t see him as himself but as his character (which is the point of great acting I guess). Now on the other hand I love Joaquin Phoenix (who's up for an Oscar this year) and his acting was stellar, but his character is just deplorable which made it harder to like him in this. Scene after scene of battles you would think would get really old but I must say I found myself almost biting my nails through some of them just waiting to see what would happen. Definitely worthy of its Oscar for Best Picture! Motherly Advice: Knowing that this film would have a lot of violence and with its R rating I chose to put all filters to most filtering. With those settings ClearPlay removes the intense violent moments and some sexual references. Gladiator depicts a very violent time in the Roman Empire where fighting and wars consumed many lives. Death is by sword, hanging and multiple means used within the arena where the Gladiators fight. Commodus is an evil dictator with conniving and sneaky ways to accomplish his desires. Innocent women and children are killed or the threat of their lives is mentioned. Some discussion around an incestuous relationship between brother and sister but it is not reciprocated by one of the parties. I am inclined to say adults only, due to violence but may be okay for ages 16 and up with filtering. Hannah – ClearPlay Entertainment Seeker!